Chappie is the story of how in a futuristic Johannesburg, the notoriously high crime rate is neutralised by a mechanical police force known as scouts. Deon Wilson, played by Dev Patel, is the creator behind these scouts but his ambitions for the robots stretch far beyond simply solving crime. He aspires to create the world’s first genuine artificial intelligence that has the ability to think and feel for itself but the company he works for, Tetravaal, led by Sigourney Weaver’s character, a weapons manufacturing company, doesn’t like this idea. Disregarding his superior’s orders, Deon decides to create an A.I. anyway and thus Chappie is born, but not before this revolutionary robot is high-jacked by a trio of thugs, who attempt to turn Chappie down the road of crime and gangster culture. And thus begins a battle for the innocent Chappie’s well natured heart and soul. All the while, back at Tetravaal, Hugh Jackman’s mullet-sporting, short wearing Vincent Moore plots against the kind spirited Deon after the bitterness at not being able to use his crime fighting robot invention, the MOOSE, becomes too much. Director Neill Blomkamp, whose other films include the hugely popular and critically acclaimed District 9 and the not so popular or acclaimed Elysium spoke recently about how the latter was let down by the writing saying: “I just didn’t make a good enough film is ultimately what it is.” Such honesty is rare these days from Hollywood directors and it’s this honesty that can be sensed throughout his latest project. Chappie is a film with ambitions and one that isn’t content with being a average action flick, diving into deeper issues such as the dynamic between a parent and child relationship along with the burning question of what it means to be conscious. There are some great scenes that encapsulate that early confusion we all felt growing up as we tried desperately to make sense of the world around us. There’s also plenty of humour as Chappie stumbles in his early days to make sense of right and wrong including the films funniest sequence involving a car-jacking. Most of the films best scenes involve Chappie, played by Sharlto Copley, who has a genuinely charming quality to his behaviour and carries the film when it begins to be bogged down in sub-plots later on in the film. Some people have already drawn unfair comparisons to the famously irritating Jar Jar Binks from the Star Wars films but the truth is Chappie never really gets anyway near as annoying as that character did. Far from it, he remains charming and interesting throughout. Away from the title character, the film doesn’t particularly have any enduringly interesting strands with the sub plot of Hugh Jackman’s bitterness at not being able to use his robot, wearing thin quickly. The problem is that the film doesn’t spend enough time developing these elements or themes that it hints at and prevents it from being truly profound or insightful on the topic of artificial intelligence. There is also an issue with the casting of the central trio of gangsters that Chappie spends a lot of the film with. All three are frankly unlikeable and uninteresting to the point of it being maddening especially when so much screen time is devoted to them. It’s a film full of potential and risks but tries too hard to be too many things at once to cash in on this potential and become a classic like District 9. Nevertheless we should be grateful that in an industry with so few genuine risk takers, wary of stepping outside of their comfort zone, Blomkamp is one who isn’t afraid to make dicey decisions. A loveable central performance, some interesting ideas, plenty of humour and an exciting look at the urban crime scene in Johannesburg are enough to carry Chappie over the line and move it away from being simply generic or even worse, boring. It’s far from boring with Blomkamp once again showing a real cinematic flair for science-fiction, the sort of flair that convinced the kind people at 20th Century Fox to hire him to do the next Alien film. 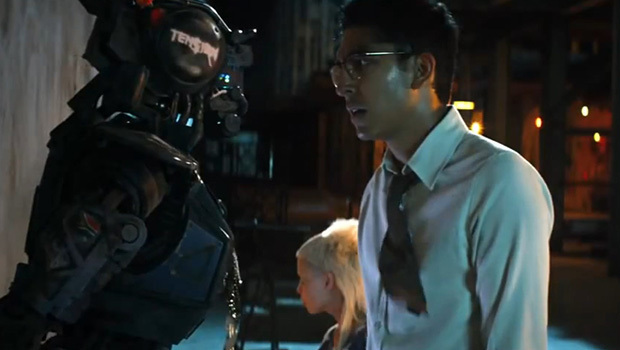 Chappie is on wide theatrical release now.